So if you don't already know, I'm sure you will soon hear that we are back at it. It's been an emotional roller coaster ride, but we have finally begun to finish the magnificent work that John Harbottle III started back in April. The contractor again is the very gifted shaper Kip Kalbrenner, owner and operator of Ridgetop Inc. He worked with John H. on possibly over 1000 different bunkers since he started his own business in 1989. It's safe to say he knows what he's doing. He is really the only contractor to work with me at Tacoma since I came back as Superintendent in 1999, so you can imagine we have a great understanding of each other. The new player on this team is the brilliant architect Nick Schaan of DMK (David LeMay Kidd Design). He worked with Harbottle on over 24 different design projects before making the move to DMK which has given him the opportunity to work on some of the best properties all over the world. I can tell you the three of us get along very well and as a big a project as this is, it may not be enough to fulfill the passion we all have for this kind of work. We are very "into it"! Here you see Nick and Kip studying John's work on #11 and #16 (below) before starting up the project. So after careful consideration, it was decided to essentially start at the farthest point away from the property's entrance and then work our way out. So here we are on #14. The two greenside bunkers have already been shaped and as planned, the back bunker has been removed and replace with a "run on" area. Below you see that Kip did a really nice job making the back bunker go away. It's impossible to tell that there was ever a bunker there. This is a very large project so we are going to be careful to stay on budget as we go so as not to get ourselves in a situation where we might need to make compromises. By measuring the square footage of each bunker and each area that is disturbed, we can make good predictions of what each bunker will cost to rebuild. Below you see that double bunker complex on 13 fairway that is now just going to be one bunker. The rough shape of this area is almost finished so I'll have some pictures of that on the blog very soon. It is really going to be an awesome spot. The 11th green complex (above) is going to be absolutely stunning. The two bunkers on the left are almost completely roughed in and they are looking seriously nasty. If you challenge this short par 5 in two, you will not like missing the green left. The bunker on the right is being filled in and becomes a "run off" area. We all know how fast that green is from right to left so it will take a delicate touch playing from there. Next week we will be breaking ground on the grand daddy of bunkers at Tacoma. This monster bunker is so unique in that is protects the landing area on two holes.......7 & 16. Because of it position, it will have the muscle of the fescue eyebrow in different areas that are broken up by mowed and less severe areas. It will simply be a work of art. I can't wait to get into this one and I'm telling you, Kip and Nick are also drooling over it. Boo is posing in front of another bunker scheduled for reconstruction next week. This trap has been "out grown" by the maple tree which now blocks your shot if you find the left side of it. 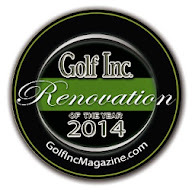 It's new home will be more to the center of the fairway and pushed toward the green slightly. If your a big hitter, your going to have to challenge this hazard and after seeing what Nick wants to do with it, I'd lay up if I were you. You can probably imagine this is a pretty exciting time for me. Our bunkers are way over due for this overhaul. By the way. 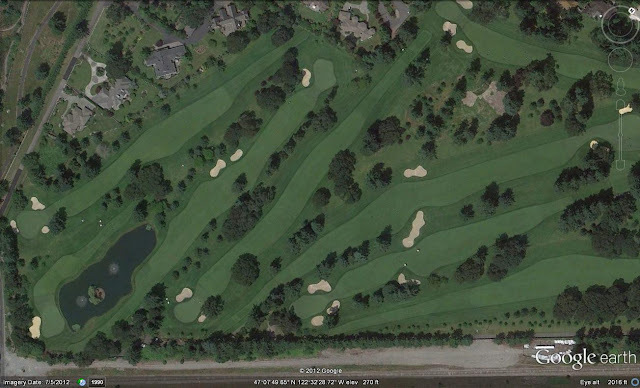 Google Earth has updated their images of our region so now you can look at how cool the new teeways look from above. In the center of this photo is the 12th hole which is one of the few holes that we have the finished look of a seemless transition from teeway to fairway. The hope is to have all of the holes finished by next season.